Alice Telford on the road during the 2011 Little Red Riding Hood. Photo: Robin Perkins. I don’t think that women’s cycling or cycling in general in Utah would be what it is today without Alice Telford. We all owe a remarkable amount to her. She’s absolutely incredible. At last year’s Little Red Riding Hood Ride dinner, I had the chance to introduce my friend Alice Telford, to an admirer from Colorado. The woman from Colorado, Teresa Robbins, had been profiled in Bicycling magazine in 2008 for what she had done to promote women’s cycling. Yet Teresa, the founder and executive director of the Venus de Miles women’s rides, was in awe of the petite octogenarian in front of her. Teresa felt that Alice was one of women who helped kick off the new wave of women’s cycling in the last decade of the 20th Century. We asked Alice how far she was going to ride the next day. “Just about 65 miles,” the 87-year old replied, adding that she would have to do that in two loops to avoid hills which would put a strain on her recent knee replacements. “Now I’m really intimidated,” Teresa joked. Alice truly has been a modern pioneer for women’s cycling in Utah. It was Alice who started the Little Red Riding Hood Ride twenty-five years ago in Cache Valley. This women’s ride has grown over the years from a couple dozen the first year, hitting the 100 rider mark in the early ‘90s to 3500 in 2012. This northern Utah ride has become one of the classic women’s rides in the US and has spawned many others around the country. In Utah alone, there are now seven women’s only rides including Little Red: The Goldilocks Ride (which is also in Boise and Las Vegas), Spokes for Hope, Wonder Woman Century Ride, The Wish 100, Ladies’ Pamperfest Challenge and the brand new Wildflower Pedalfest. Many of Utah’s and Idaho’s rides were started because the Little Red Ride had become so popular; it always sold out quickly, disappointing thousands of women. Most of the ride directors told me they first became inspired to start their own ride after they found it difficult to get one of the coveted registrations themselves. One such disappointed would-be rider from southern Idaho, DaNae Young, started a new ladies-only ride, the Spinderella Ride which will debut this June in Pocatello. She began the planning just a few days after Little Red sold out all 3500 slots in less than an hour on February 1, 2012. Little Red Riding Hood founder Alice Telford. The popularity of women’s only rides may be bewildering to many men. Why do so many women want to ride without men alongside and what is the big attraction with these rides? Is it the camaraderie between women, the fun rest stops, the festive atmosphere or the non-competitive setting? Maybe it’s all of the above. One man, who seemingly now “gets it,” wrote Bonneville Cycling Club to thank them for the change it had made for his wife. He had once begged her to go on Saturday rides with him to no avail. After she found out about the Little Red Ride, she was intrigued with the idea of a women’s only ride and signed up. She found it so fun and so inspiring that she became an avid cyclist and these days enjoys those long rides with her friends and her husband. Other women have mentioned that the women’s only rides feel a lot less intimidating and the menu of varied distances from fairly short to century length mean that cyclists with a variety of abilities and a variety of bikes can take on an appropriate challenge. The family friendly atmosphere is also unique and it is common to see sisters, mothers, daughters, granddaughters and grandmothers enjoying the rides together. It’s surprising and yet inspiring that Alice took up cycling relatively late in life. She initially got a bicycle just to give her a quick and easy way to get around the housing development where she was working as a broker. She was then a member of Zonta, an international advocacy organization of business and professional women. At Zonta she met several women who told her how much fun they had with their cycling club. Soon after she joined the Bonneville Bicycle Touring Club (now called Bonneville Cycling Club) and wholeheartedly embraced cycling. She was then 61. She regularly brought her mountain bike with her on road trips and cycled every place she visited. She got out her passport and cycled through France, down to Mexico, did a two week cycling/camping trip across Siberia, and took several trips to cycle through China and Canada. She cycled around the Gulf Islands, the San Juan Islands and around Vancouver Island. At age 67, she and a friend also rode the epic mountain trails from Telluride, Colorado to Moab, Utah, which is a 217 mile trip that crosses up and over mountains. Riders enjoying the roads of Cache Valley in the 2011 Little Red. It was in those early years of cycling when she and some friends visited California and rode the Cinderella Classic women’s ride. It was not only a lot of fun, but she thought it was a great way to promote women’s cycling. Always the advocate for women, she began thinking of how she could put together something similar in her home state of Utah. 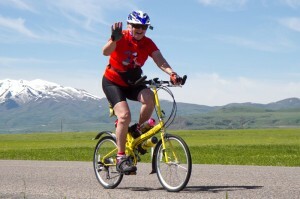 It was while she was on a ride with her friend Sue Shawle through pastoral Cache Valley with its small homey towns surrounded by lush farmlands that she knew she found the perfect spot for this new women’s ride. It took a year to plan the ride and she didn’t neglect the details. She and Sue planned a 100K route with rest stops, got all the proper approvals and permits and even lined up a support crew made up of her good friend Jon Smith and several other men who would be the sag vehicle and help with the occasional flats. Then she ordered a lunch for the two dozen women who would take part in that first ride and thus, the Little Red Riding Hood Ride was born. If anything, the proliferation of so many women’s rides is a sign of a renaissance in women’s road cycling and it is quite visible here in Utah. Cycling has long been dominated by men, and even now only 1 out of 4 cyclists you see on the road will be a woman (Women’s Cycling Forum, 2012 National Bike Summit). Yet it takes a look back to see how far women’s cycling has come in the years since Little Red Riding Hood Ride was first launched by Alice Telford in 1987 to truly appreciate what she and other modern pioneers of women’s cycling have brought about. Really, Alice couldn’t have timed the launch of Little Red better. Just a few years prior, American Connie Carpenter (who later married Davis Phinney) won a gold medal in road cycling at the 1984 Los Angeles Olympics, the first time women had been allowed to compete in cycling. It was about the time that another modern pioneer of women’s road cycling, Georgena Terry launched Terry Precision Company in 1985, designing women’s specific bike frames and saddles. Women’s bikes before then had not been fully engineered to fit most women, and certainly not very short women. The standard women’s bikes in those days had the “shrink it and pink it” design theme and bike companies hadn’t made much of an effort to target women as customers. Cycling clothing for female road cyclists wasn’t easy to find either. In the 1990’s Georgena Terry became the first to introduce a line of cycling clothing designed especially for women. The clothing was well-designed, actually pretty and would fit a variety of different women (not just the tiny, trim women) and the sales took off. The larger bicycle companies soon took notice. Trek was the first of the major bicycle manufacturers to take the lead and introduced their WSD (Women’s Specific Design) line in 1999. Cannondale introduced their Feminine group of bikes in 2002 and Specialized brought out their Allez Dolce women’s road bike in 2003. Whether or not you think women need a road or mountain bike designed for women’s geometry or not, it definitely was a marker as bicycle companies made a real effort to cater to women. By mid-decade, women’s specific bikes for road, mountain or triathlons got a big upgrade in quality: lightweight composite or carbon fiber frames and premium components. It was about time! Like Alice once had, many women are now taking up cycling and enjoying it later in life. The festive women’s rides are just one of the ways women are being introduced to cycling and embracing it fully. Women are also finding that bicycle shops love having them as customers, not only are they selling women’s specific cycling products and holding “Ladies’ Nights,” but they are sponsoring women’s rides. For Utah, there can be a special appreciation for a small women’s ride that began on the beautiful country roads of Cache Valley, 25 years ago and how it helped launch a women’s movement on two-wheels. 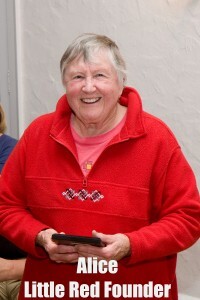 Up until Alice was hurt in a car accident in August 2011, she kept up a Jack LaLanne schedule: working full time at Zion’s Bank and exercising with a daily regimen of stair climbing and cycling. She said she kept her long ride mileage below 70 miles, while riding with her Smell the Roses cycling group on her Bike Friday after her knee replacement surgery four years ago. Last summer’s accident has slowed her down and she has been frustrated with the set-backs but dutifully goes through the physical therapy with the tough mental attitude of an athlete and the positive attitude she is well-known for. At 88, Alice remains an inspiration to so many of us! Tara McKee is editor for cycleandstyle.com, an online women’s cycling magazine.